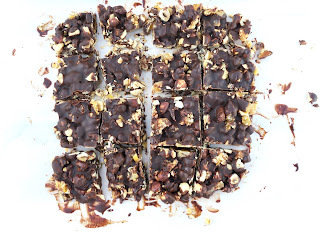 Here is a delicious semi-healthy and fun snack that’s easy to make. The hardest part is waiting for the chocolate bites to set. Original recipe called for dried cranberries and sunflower seeds. In this instance I used dried apricots and roasted unsalted hazelnuts, a match made in heaven. There are so many great flavor combinations to choose from, what are some of your favorites? Inspired by “Super Foods Every Day” by Sue Quinn. Line baking sheet with parchment paper. (set baking sheet upside down on parchment paper and trace with pen or pencil, cut into correct shape). In a heavy skillet over medium heat, warm hazelnuts until lightly toasted about 3 minutes. Add apricot pieces and sprinkle over sugar. Stir constantly until sugar has melted. Scoop and flatten mixture onto baking sheet. 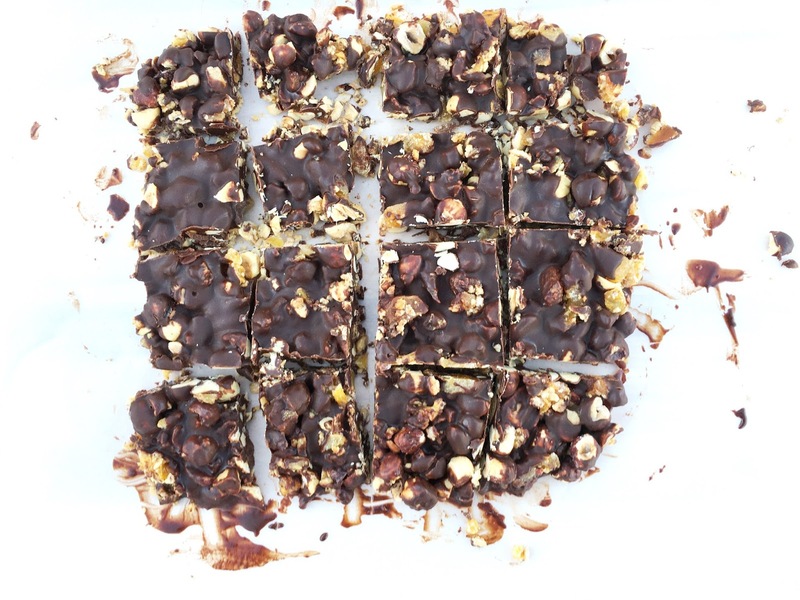 In a double boiler melt chocolate and coconut oil, mix together. (Be careful not to let water get over a simmer, chocolate will seize). Remove from heat and add cream and vanilla. Stir until slightly thickened. Spoon chocolate over fruit and nut mixture, spread to cover. Chill about 2 hours. Cut into pieces. Chocolate, dried apricots, and hazelnuts sound beyond amazing -- I could eat all of this myself! Thanks Marcie, me too, next time I will make a smaller batch. Goodness bites is a great name for these. I'd be saying thank goodness with every bite! Thanks Abbe, you are so right! Chocolate and apricot go so well together, don't they. It is one of my favourite flavour combos at the moment. Yum, sounds like a great snack for enjoying while doing winter sports! Thanks Chris, yes and little bite here and then a little bite there. My kind of snack, Cheri. 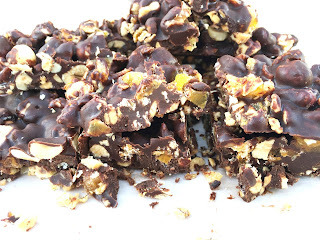 Love the combo of dried fruit, nuts and chocolate. Thanks Angie, appreciare you stopping by. Happy week-end to you! These little bites are indeed goodness incarnate! Wonderful recipe -- thanks. Thanks Shari, thats the problem, I am stilling nibbling away at this myself. Hi Amy, oh both of those variations sounds delicious too! Have a great week-end! Hi Marcelle, I bet this would be delicious with pecans too. Have a great week-end! Yummy! I know this is delish as I love hazelnuts + chocolates. .. love this combi ^-^! This is just the sort of thing I like. I have to give it a try. Pinned. Thanks Amalia, hope you have a chance to give it a try. Thanks Kim, you are so sweet. What a wonderful snack! I love it! Yum! (Which keeps trying to autocorrect to Yuma - my iPad knows it's in Arizona!!) I love your version so much more than the original! Apricots and hazelnuts are things always at the too of my list! lol, you have to watch that autocorrect for sure......Thanks David. Absolutely yummy. Sounds like great choice. 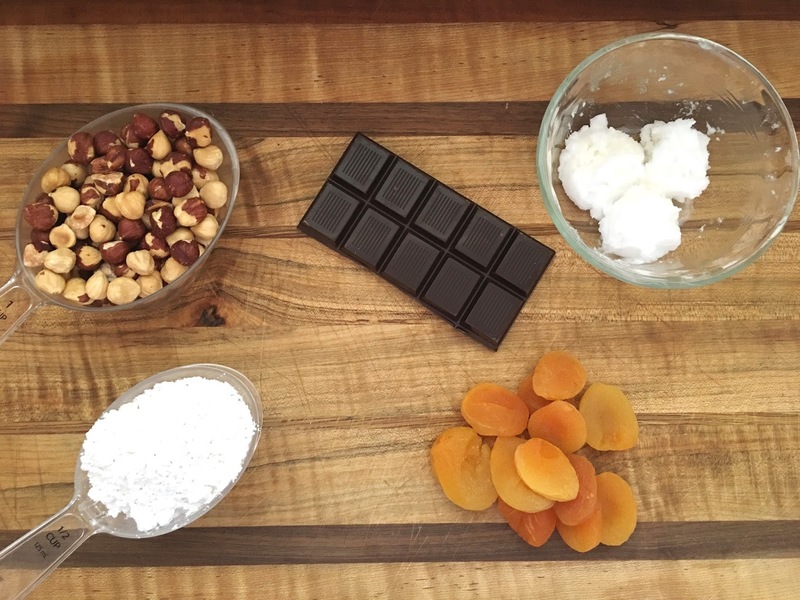 Chocolate, dried apricots, and hazelnuts sound super delish. Lovely share, Cheri. 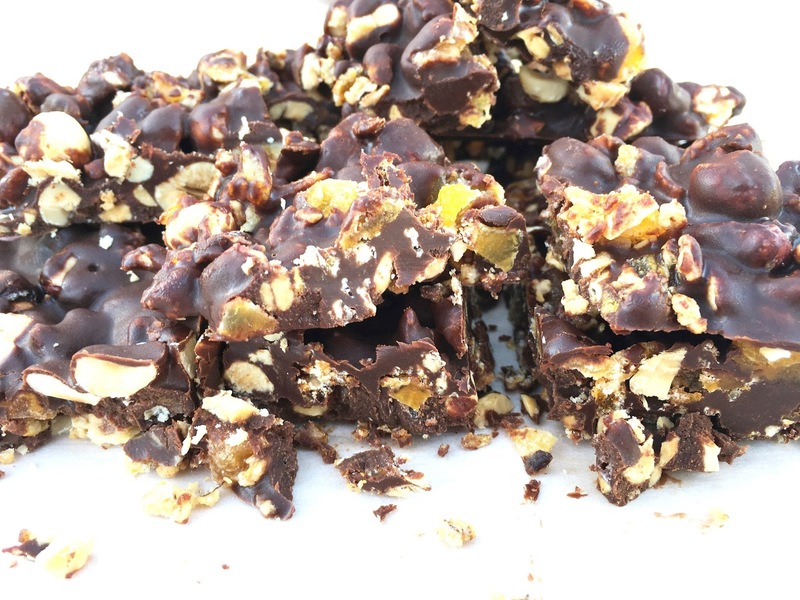 apricots and hazelnuts are both items i don't usually see in chocolate bark like this--very clever and very delicious!